Normally, the cabin space of a truck is limited, and it is unusually difficult to handle a dog inside the cabin while driving. The most feasible solution is to fix the dog box in the bed of the truck and securely deport the pet in that box. Here is a stepwise procedure to build a strong dog box. The first thing that needs to be done is to select the design of the box. The design would depend upon the size of the dog and the amount of space available in the truck bed. The box should occupy the minimum amount of space, but at the same time, the pet should also be comfortable inside it. On an average, the box should be 39’’ long, 24’’ wide and 22’’ high. As far as the resources of the design are concerned, lots of options are available like internet, television, movies, magazines, and so forth. Once the design has been selected, its time to choose the building material. Aluminum is considered to be a good choice because it is light weight. Other metals and toughened plastic are also considered to be equally good. If wood is used for the dog box, then it should be weather resistant. Cut the chosen building material into six pieces depending upon the dimensions. The dog box should be properly ventilated. Hence, on the two sides of the box, cut small holes. Do not cut holes on the top or bottom, else water can penetrate inside the box. After the holes have been made, sand the edges as these may cause injury to the pet. 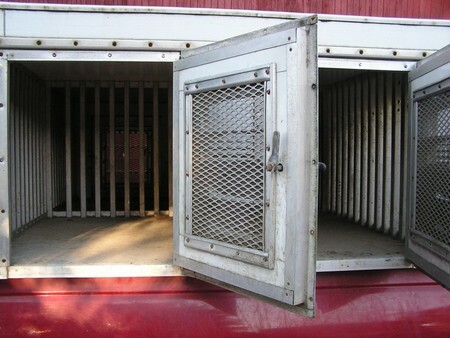 On one side of the dog box there should be a door for the safe entry and exit of the pet. The next step is to assemble the unit. Use weld or bolts to put the parts together. Ensure that the door is properly attached to the box and opens easily to allow the dog to slip out. When the box has been assembled, sand the exterior and give it a fresh coat of paint. Install the dog box on the truck bed with the help of bolts. Thereafter, make the interiors comfortable for the pet. Test the dog box without the pet. It shouldn’t move or shift even on the rough road. It should be well-ventilated, snugly and cozy. Inspect the interiors carefully, it should be absolutely safe and secure.